Choosing the right shower is less simple than choosing most other bathroom fixtures and fitting. There are so many things to consider before you can even think about aesthetics — what plumbing system you have, whether you want a walk-in or over-bath shower, and checking your water pressure is up to the job, all have to come first. Here we explain all you need to know about choosing the right shower for your home. Electric showers heat water on demand, taking it from the mains cold water supply and passing it over a heating element inside the shower unit. On the plus side, you will not run out of hot water with an electric shower and they heat water as needed so there is no wastage or storage which affects overall energy efficiency. Mixer showers use hot and cold water supplies, mixing the water in the unit as it leaves the showerhead. These are suited to homes with a combo-boiler or large hot-water cylinder as they rely on readily available hot water. A pump can be added in cases of low water pressure. Thermostatic showers prevent the risk of scalding (or freezing) when someone turns on a tap elsewhere, or flushes a loo. You set your temperature and the mixer automatically maintains this be feeding in the right amounts of hot or cold water. An electric shower can do this too, but a thermostatic shower gives peace-of-mind where children or the elderly are involved. The Etros shower (Frontline Bathrooms, £895) is manufactured from solid brass and features a traditional head and wall-mounted arm with concealed thermostatic shower valve. It’s suitable for high-pressure systems. Eco versions can be specified for both electric and mixer showers. They limit the water flow to an efficient (but usable) level offering 50 per cent reduction in water usage compared to conventional mixers. Digital showers can be controlled by a panel located anywhere within a 10-metre radius of the shower. The panel then communicates with the power unit, located either in the loft or airing cupboard, to adjust the flow and temperature of the water. Water at a preferred temperature is then delivered through the ceiling or wall to the showerhead, and there is no unsightly plumbing visible. They can come as electric or mixer variations and be operated by remote control. There are even digital showers that can be integrated with Amazon’s Alexa currently on the market. The concealed SmartControl from Grohe allows you to control three shower functions via a slim, discreet panel with start/stop buttons and volume control. It’s also possible to enjoy two head shower functions simultaneously. From £1,370. Which Water System Do You Have? While we may all want a huge shower head that drenches us in water of just the right temperature in an instant, in reality many of us end up disappointed, with a trickle rather than a deluge and with wild temperature fluctuations. This does not have to be the case, and avoiding it is simply down to choosing the right shower for your hot water system. Older homes tend to feature gravity systems. These have a hot and cold feed, with a cold water tank – commonly referred to as a header tank – usually located in the attic, and a hot water cylinder, often found in the airing cupboard. The contents of the cylinder can be heated by either an external heat source such as a boiler, or an internal heat source such as an immersion heater. 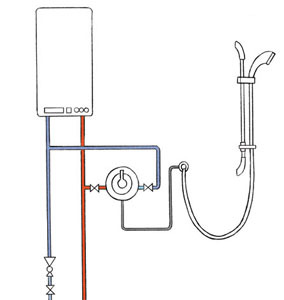 The pressure of a shower connected to this system depends on the distance from the bottom of the tank in the attic to the shower head — known as the ‘head of water’. The greater the distance, the higher the water pressure, and it is recommended that this distance should be between 3-4m for adequate pressure. The good news for those with this type of system is that they can be fitted with booster pumps in order to increase the shower’s performance. Also known as ‘pressurised’, ‘unvented’ or ‘sealed’ hot water systems. Rather than a cold water header tank providing gravity pressure at 1bar, the pressure in the mains water supply in the road is used to pressurise the hot and cold supplies. A minimum pressure of 1.5bar is necessary, but ideally 3bar. A pressure-limiting valve is usually used to keep the pressure from rising above 3bar. 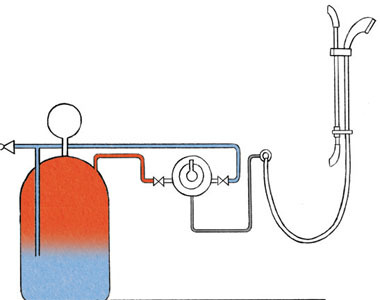 The hot water supply can either be heated directly on demand by a combination (combi) boiler, or via a thermal store. 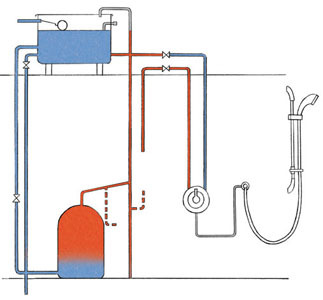 Alternatively, hot water can be heated in a cylinder, by a secondary coil on the central heating system. The cylinder has to be specially designed to store hot water under pressure, such as the Megaflo, by Heatrae Sadia. 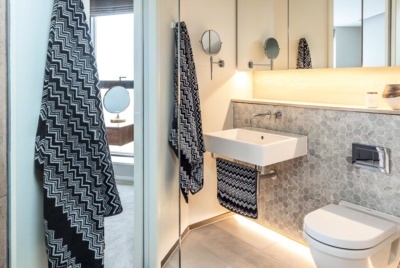 A pressurised system with an unvented cylinder will provide a powerful shower, without the need for a pump, and balanced hot and cold water pressure can eliminate the need for thermostatic mixer valves. Pressurised cold water is heated on demand, and so in theory should never run out. If you want a powerful shower, the key is to make sure that the combi boiler is powerful enough to supply a hot water flow rate of at least 12-15 litres a minute. The larger the shower head, or number of nozzles, the greater the pressure required. With a combi it is best to choose a thermostatic shower mixer valve, to even out any temperature fluctuations that can otherwise occur. Temperature and pressure is most commonly controlled by a thermostatic tap, which will detect changes in water pressure and temperature and respond accordingly. Some models now allow you to preset the temperature so that when you turn the shower on it is exactly as you want it to be — remote-controlled digital showers, such as those from Aqualisa, are a good example. Handheld showers are really useful, if only for a second shower head – some are available as pull-out fittings that ping back into their holding in the side of the bath – as they are handy when rinsing off messy children, cleaning the bath etc. They can also be fitted to a slider rail, which means their height can be adjusted easily. Most shower heads are now available with multiple spray options. Huge shower heads (sometimes called ‘rain showers’), often ceiling-mounted, have also become popular, designed to totally drench the showerer in seconds. Multiple-jet showers are another big trend, comprising not just one shower head, but a host of side jets and sprays. Unless you are opting for an over-bath shower, you will need a shower tray or base, where water can drain away. Some are designed for use with enclosures, others are designed to lie flush with the floor for walk-in units. Ceramic trays are regarded as the best option, being strong and stable. 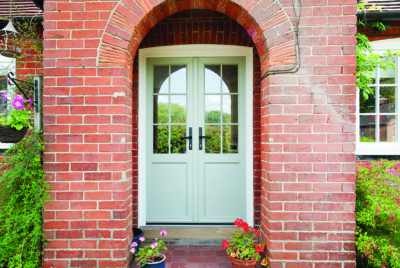 However, enamelled steel and acrylic are also options, as are those made from stone and even water-resistant hardwoods. When installing a tray, remember that you will need to be able to access the waste for maintenance. It is often seen as better to have a separate enclosure as opposed to an over-bath shower. However, do not squeeze an enclosure into a tight space as this will just result in a claustrophobic shower. Although there is no set minimum size for an enclosure, it is not advised to go smaller than 900mm² — smaller can feel, well, really small. Enclosures are made up of panels, a door and a shower tray, and complete kits can be bought to be fitted on a DIY basis. Alternatively, make use of a recessed area, adding just a door and tray. Walk-in showers differ from enclosures in the sense that they are more of a showering area as opposed to an enclosed unit. They usually feature just one glass panel separating them from the bathroom, with no door. Walls and floors must be fully waterproofed, as with wetrooms. Offering far more in the way of features than an ordinary shower enclosure, shower cabins are all-in-one units, incorporating enclosure, tray, shower and body jets, not to mention the extra options that most now offer, including LED mood lighting, seating, steam, fragrance and music — some even double as sunbeds. Shower panels, or columns, are another trend, featuring controls, shower head, body jets and various other features in one wall-mounted unit. They use a lot of water, but they will make your bathroom feel like a spa. Prices start at around £5,000. A shower that suddenly runs cold or hot is downright annoying — and dangerous. Temperature variations occur when the pressure between hot and cold water is not balanced. So, if someone flushes a toilet, the cold water flow is reduced and the shower will turn too hot. If the hot tap is used, the shower will run cold. A shower with a built-in thermostat will overcome the problem. They sense variations and then compensate. Models that cut out before water reaches too high a temperature are also available. Despite often being seen as second best to enclosures, over-bath showers make more sense for many bathrooms, especially those not large enough to take a separate enclosure, or in households with young children. Forget mould-riddled shower curtains and opt instead for a sleek frameless glass shower screen. 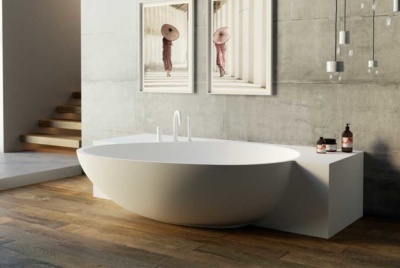 Shower baths are now also widely available, with a curved section at one end for a more spacious showering area. 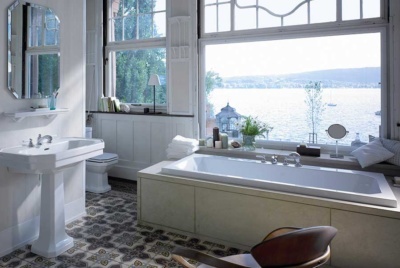 Choose a flat-bottomed bath to provide maximum showering space and to avoiding slipping over when climbing in and out. It used to be a given that a shower used less water than a bath — not so these days with power showers and enormous shower heads being the norm. 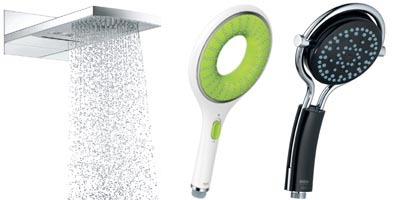 Water-saving shower heads come in several forms. Some are aerating, mixing water with air to reduce the amount of water used. Others reduce the flow rate – hopefully whilst maintaining the power – or include a flow restrictor to the hose. Some are only suitable for use with mains systems. Many water-saving shower heads can be fitted to your existing shower unit, although they are not often recommended for use with electric showers, as some are already often low flow.